You may be experiencing a sense of deja vu: a year ago, having spotted that the search term, ‘minimal Ironman training’, featured regularly in my site statistics I wrote a post chastising those who sought to complete an Ironman without putting the work in. How things change. Those three words still bring new readers to my site, mostly to be told they shouldn’t be entering an Ironman, yet my own training shares more with the minimalism they are intending, than the life encompassing approach I have typically presented. It seems ironic that I am now spending the season doing just enough to get me round and not – at least – offering some advice for those looking to do the same. Before I begin, you do know there are other distances? Half, olympic, sprint? Performing your genuine best at any distance is hard; and with the shorter formats there is the additional bonus that you won’t lose the entire day. Before my mechanical at Wimbleball I was excited by the idea that I would be finished in time for lunch. Reducing the race distance reduces the training volume, few sprint programs will ever require a five hour ride. Where a minimal program for Ironman may well mean targeting completion, the same hours for a shorter race potentially give the opportunity for competition. But possibly – as I realised I am during Wimbleball – you are fixated with the notion of 140.6 miles of racing, and nothing else will cut it. For those who absolutely have to race an Ironman and are willing to accept that with limited time investment comes limited performance, these are my thoughts on how to get through. First – time. What is minimal Ironman training? I’m sure we all have our own definition, but my criteria is – less than 10 hours per week. I’m keeping the definition broad; I don’t want to alienate an athlete only planning to do five, but I think they are nuts – they are not going to enjoy that race. Instead I hope those looking for a minimal solution are thinking of around 8 hours, maybe stretching to ten; perhaps with an odd long weekend, after all it would be nice to have the occasional endurance session. Second – consistency. 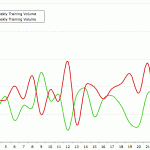 Doesn’t matter whether it’s a high volume or low volume program, if you’re not consistent the plan won’t work. You are setting yourself up for a lot of suffering on race day. I have repeatedly proven this to myself – I have trained without consistency and watched races unravel; to be honest, I don’t enjoy it that much. Do the few, shorter sessions you have every week, stick with it and don’t waste time with recovery weeks, chances are you’re already getting enough. Third – intensity. If you are not training as much, train harder. Forget arguments about specificity, you abandoned specificity when you entered an Ironman planning to prepare on low volume. Swim, bike and run hard every week, perhaps not every single session, but most. There is little time for soft pedalling when you spend little time pedalling. Eight to nine hours per week – two swims, three bikes, three runs. Most days requiring less than an hour of training. Simple. By my standards minimal. We could still lose a bike if required and get round the course – there, that’s 6 or 7 hours. If you can repeat this training every week for a few months you’ll be fine. You may not be fast, but you will be fine. Then, on top of this, if you can occasionally spare the time, making that long ride longer – 4 or 5 hours – and taking that long run to 2 hours will pay you back on race day. If you can sneak in an extra swim – open water at the weekend – once or twice, while still completing ride and run, it will do you no harm. If you are fortunate enough to be able to attend a training camp at some point during your season, then you will make real gains. In fact these steps would go a long way to addressing the deficit of minimalism. If nothing else, I suspect were you actually to manage a consistent nine hours every week, you won’t be far from the Ironman norm. It would be interesting – were triathletes completely honest – to collect statistics on training hours versus performance; the majority of those on the course, the middle and back of the pack, probably won’t be averaging much more. I know from the athletes I coach that much of the year is spent averaging only a few hours over this, not a huge stretch above. Old age (thirty-six) is making me soft. Or at least a couple of years coaching experience has shown me the limitations age group athletes face and the need to balance the desire to race long against these. I still believe many, myself included, would be better placed and have an entirely more enjoyable experience were we to – sensibly – race shorter events, but I can’t deny Ironman has allure.